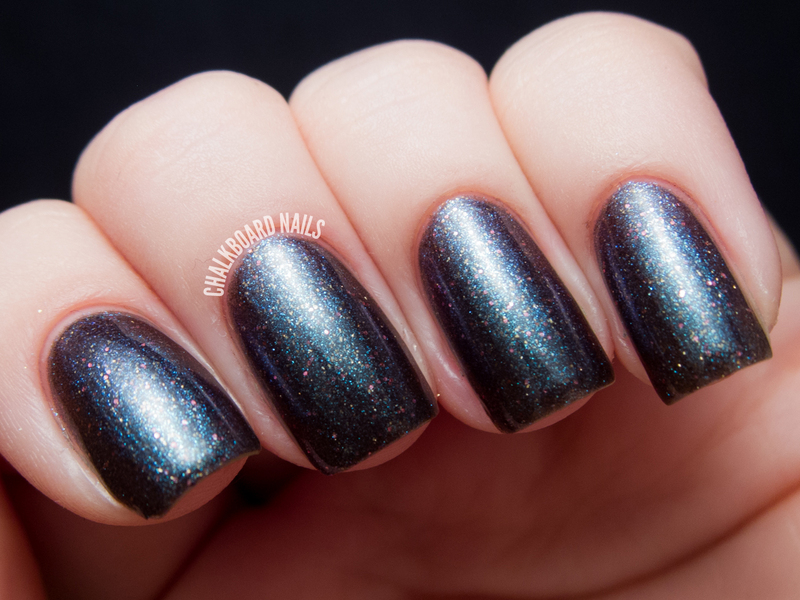 Anaconda is a deep graphite scattered holo with a pinky shimmer and a green duochromatic shift. The formula on it was beautiful, needing just two coats for the coverage below. I love the visual texture that the scattered holo provides, it looks a lot like graphite doesn't it? Here you can see the green duochromatic shift. Here is Anaconda in direct light -- you can see the holo light up here! 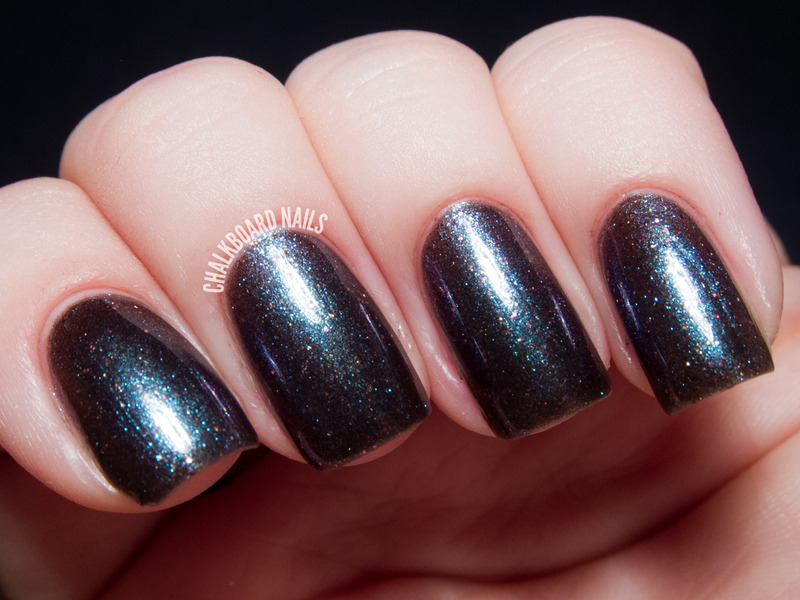 Black Mamba is a black jelly polish with green shimmer and green glitters. Again, it had fantastic coverage, only needing two coats for opacity. It's very witchy, in my opinion, and would also transition nicely into the winter season. Blue Racer is the most complex polish in the collection. It begins with a black jelly base and is accented by heavy blue/teal sparkle and pinky microglitters. The base is also slightly duochromatic and shifts to a purple shade at different angles. Three coats shown. Here you can see the duochromatic shift! In direct light, the blue/teal sparkle of the base comes alive. Diamond Back has gold flakes and gold shimmer in a clear base. I've shown it here over OPI Don't Touch My Tutu to highlight the flakes, but it should be noted that over dark colors, the shimmer turns green. I really like this delicate, simple look though. Jugular Vein is a pearly brick red shade. It's definitely a perfect fall color, and the formula only needed two coats for the opacity shown here. Definitely not the kind of shade I am normally drawn to, but I did really enjoy this when it was on my nails. I can't wear these without thinking of Jafar saying "Perhaps you'd like to see how snakelike I can be!" Which one would you wear to bring out your snake side? SoFlaJo polishes are available via the SoFlaJo website. She is also now offering flat rate shipping on both domestic and international orders, for $2 and $10 respectively. You can keep up with the brand on Facebook, Twitter, and Instagram. Great colors and perfect for the fall! Blue Racer is definitely my favorite :). Stunning! The first three are so great! Want!